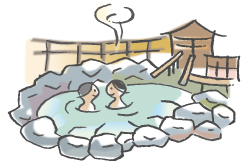 In distribution center neighborhood of Yamagata-shi "is Dainome hot spring/great eyes hot spring Oiwa bath. There are the accommodations, too and is got close to many people. ■Others ※Please refer for Details such as rate, business hours toward the direct facility.